AMTECH™ Needle valves are specially made for general instrumentation services. 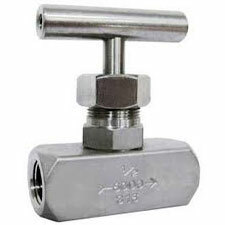 Our valves are very high quality precision machined, regulating and shut-off valve. The compact, reliable and unique designed features within the valve enable it to be used for the most sevices.Pressure rating 150 psi,300 psi,1000 psi, 3000 psi,6000 psi,10000 psi. MATERIAL OF CONSTRUCTIONS- BODY & BONNET AISI 304 ,AISI-316(CF 8 M), AISI 316 L (A 351 CF3,CF3M ), GUN METAL, ALUMINIMUM BRONZE, HAST ALLOYS, CARBON STEEL,FORGED CARBON STEEL-A 105.